No barges again today. 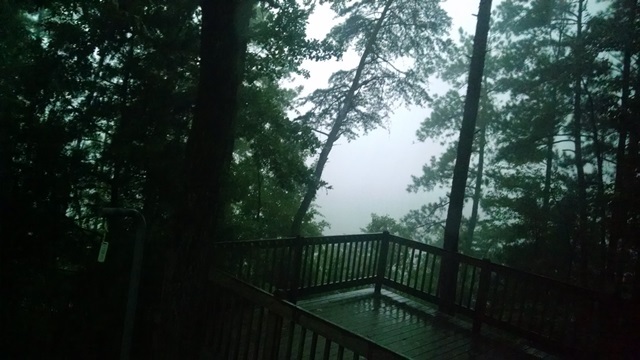 But we did get the storms. It sounded like lightning struck somewhere close by this afternoon. The campground lost power for a few minutes twice after close strikes. You couldn’t see across the river or the dam it was raining so hard. On the plus side, the temperature dropped to 72 for a short while. Incredibly cool for August in Alabama. It’s actually quite nice out this evening and we are sitting out on our deck looking over the river working on this blog entry. Hopefully our ThermaCell will keep the mosquitoes at bay. We were able to get both our morning and afternoon walks in today. We have been blessed the last several weeks to be able get more exercise and we can both tell we are feeling and sleeping better than we were for a while. Otherwise, we did some more estate work, and paid bills for Helen and Jean. We also ate breakfast and our late lunch (grilled again) on our patio. We also met some folks that came in last night and visited with them a while, of course sharing the NOMADS story. Sure enjoying Deerlick Creek COE campground. Enjoying it so much we decided to extend our stay. We will go back to Blount County this weekend but it’s not much further from the campground than Mama Ruby’s house and it’s so nice here. 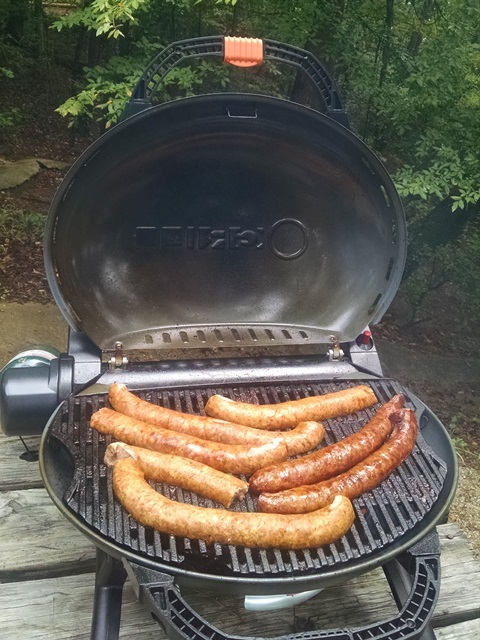 Finally got around to grilling the smoked sausage we bought at the street market in Baton Rouge.